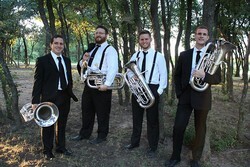 The North Texas Euphonium Quartet will perform at 7:30 p.m. Saturday, Feb. 10, in Cole Concert Hall on the SFA campus. NACOGDOCHES, Texas - The North Texas Euphonium Quartet will fulfill its goal of bringing new euphonium quartet music to the spotlight when the ensemble performs at 7:30 p.m. Saturday, Feb. 10, in Cole Concert Hall on the Stephen F. Austin State University campus. The NTEQ is comprised of Dr. Danny Chapa, adjunct professor of low brass at SFA; Dr. Irving Ray, euphonium player in the United States Army Band; Vince Kenney, assistant director of bands/assistant professor of low brass at Drake University; and Chris McGinty, director of instrumental studies at North Central Texas College. "Currently, the bulk of euphonium quartet repertoire is comprised of arrangements and pieces written from trombone quartet," Chapa said. "Part of our goal, as mentioned in our mission statement, is to promote/advocate new works originally composed for four euphoniums." The program will feature three pieces composed for NTEQ: "NiTor EQuus" by Takahiro Iwamitsu, "Airplane" by Yuji Ono and "Goldberg's Machine" by Ben McMillan. "NiTor EQuus" won the 2017 The United States Army Band "Pershing's Own" Tuba Euphonium Work-Shop Composition Competition. According to the composer, "NiTor EQuus" is Latin for "brilliant horses," and the piece was inspired by his first impressions of the vast and open landscapes of the DFW area upon his arrival to America from Japan. "He also customized the parts specifically for each player of the group according to their personalities as well as their strengths as euphonium players - high range, low range, expressive playing, etc., for example," Chapa explained. The program will also include Iwamitsu's arrangement of Claude Debussy's "Claire De Lune," which Chapa describes as "absolutely breathtaking." "Anyone who knows this piece will be delighted to hear the group's delicate and tasteful interpretation," he said. Felix Mendelssohn's "Songs Without Words," arranged by Chapa, is an adaptation of piano solos for euphonium quartet. "I adapted these particular piano solos for euphonium quartet because of Mendelssohn's beautiful melodic and choral style part writing," Chapa said. "Each song is fairly short and programatic, depicting a character or mood which is quite indicative of the romantic time period. Mendelssohn composed over 50 of these songs, and I believe they will provide us with many more beautiful arrangements." NTEQ members have all been finalists in the world-renowned Leonard Falcone International Euphonium Competition. The quartet has become one of the most active young chamber ensembles in the country through performances at numerous universities and music conferences throughout the United States, the commissioning and performing of works written specifically for the ensemble, and educational outreach with younger euphonium players. "We have been together for five years, and these guys are some of my closest friends," Chapa said. "I am very excited to have them at SFA, and I know our students will be, as well." Visit http://nteq.weebly.com/ for more information about the artists and their music. The group will conduct a masterclass with SFA students at 1 p.m. Saturday in Cole Concert Hall. The SFA chapter of the International Tuba Euphonium Association was awarded a $500 grant from the ITEA organization to bring the North Texas Euphonium Quartet to SFA. The concert is part of the School of Music's Calliope Concert Series.